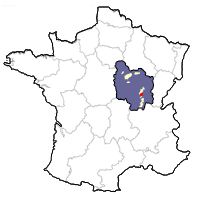 Montagny is produced in the southernmost area of the Côte Chalonnaise. The majority of its vineyards grow in a wonderful bowl-like expanse that surrounds the village of Montagny-le-Buxy, located about 10 kilometers south of Givry. Most vines face east and southeast atop Bajocien limestone at an altitude ranging between 250-400 meters. The slope is steep and terrain's amphitheater shape protects the vines from the northern winds. Other Montagny soils include marls and marl-based limestone from the Jurassic period (some 200 million years BC). The gravels from the lower Triassic period that surface at Buxy is highly reminiscent of the Kimmeridgian limestone that dominates the terroir of Chablis. Unique White Wines of MontagnyWith soils like this and a more southerly climate, Montagny understandably produces white wines that are highly original. Village wines, aged in stainless-steel, often come across like a hypothetical blend of Sauvignon de Saint-Bris and Chablis — that is, dry wines with notes of grapefruit, under-ripe pineapple, flowers and minerals. Things get much more interesting when you get to the better-exposed premier crus (although nearly two-thirds of Montagny's 310 hectares are spread over 49 premier crus!). The additional ripeness and intelligent oak aging of these cuvées often brings additional notes of white peach, pineapple, honeysuckle, pear and citrus fruits along with a kiss of vanilla and hazelnut. The premier cru wines will improve with age, gaining a deeper color and displaying notes of dried exotic fruit.